I want to dislike them, I do. But I can’t. Lego toys are always a huge draw for my kids and my 11 year old son’s bedroom often looks like a Lego Factory threw up in there. We have regular Lego sets, Star Wars stuff, Harry Potter, Ninjago, random other sets and the compatible, yet different, Bionicles. It’s embarrassing how much Lego we have, actually. The kids play together very well and often and my 7 year old daughter happily joins her brother in building and playing in the imaginary worlds and stories that are spun together based on the pieces that we have. There are outer space battles, explorations and adventures in futuristic worlds. My kids and I visited a Toys R Us store this afternoon for the first time since way before Christmas and as usual, the Lego section was the first stop for us. 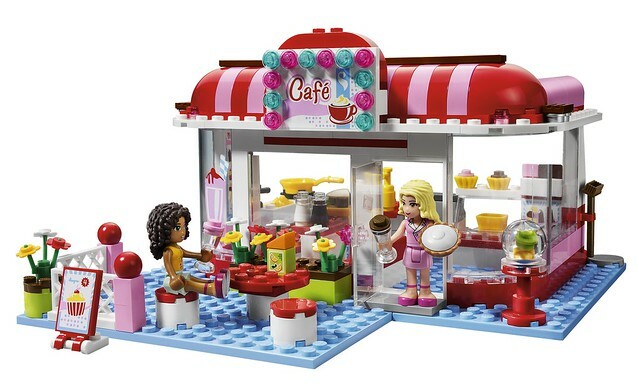 It was there that we were confronted with our first look at the new Lego “Friends” sets that are ‘targeted’ towards girls by their marketing. There are houses and cafes, inventors’ workshops and veterinarians. There are tree houses and cars. The characters are not the typical ‘mini-figs’ but are closer to ‘realistic,’ and currently include 5 girls with different appearances. I want to dislike them. I want to rant and rave and rail against the Lego company for marketing strictly to girls, assuming that they need a more gender-specific toy to play with as opposed to regular Lego. I talk to my daughter about how she can be anything she wants to be and I don’t encourage or discourage her to play with whatever toys she is drawn to. I don’t refer to ‘boys” toys or ‘girls” toys. And given the fact that that little girl can wield a lightsaber and hold her own playing Batman Lego on the Wii, she has no preference or aversion for toys that are clearly marketed to boys. There is a lot discussion on the internet on blogs, message boards and Twitter, much of it from parents who are disgusted and angered that Lego is marketing a ‘stereotypical’ scenario to our girls. I thought I would share the anger. Then we saw the pink and purple “Friends” boxes today. My daughter *freaked* *out* when she saw them and she chose to spend her own money on the outdoor cafe set and the extra character set with a dog house and a puppy. When we got home and she tore the box open, happily following the instructions to build the sets herself, she was in her glory. The sets contained things she was familiar with and could create stories about. Her ‘friends’ went for ice cream and owned a cafe. They looked after their pets and cooked hamburgers together. And when the Lego Ninjago minifigs showed up with their 11 year old ‘puppeteer,’ they cheerfully ordered milk shakes and then picked up the attached broom and helped out at the shop. I don’t hate them. I can’t rant and rail against Lego. If they were creating “Housewives of the 50’s” minifigs, I’d be freaking out, but for now, I see the happiness that my daughter has shown playing with her new toys and I know that I will continue to raise her in a way that lets her know that I am confident that she can make her own decisions and that people and companies won’t tell her what she will like to play with. I don’t see people railing and ranting against Lego for marketing the Harry Potter and Star Wars and Ninjago sets towards boys. And make no mistake, they do. What’s the difference between this marketing and marketing fighting, battle-type toys to boys? Perpetuating a stereotype of a different kind, no?